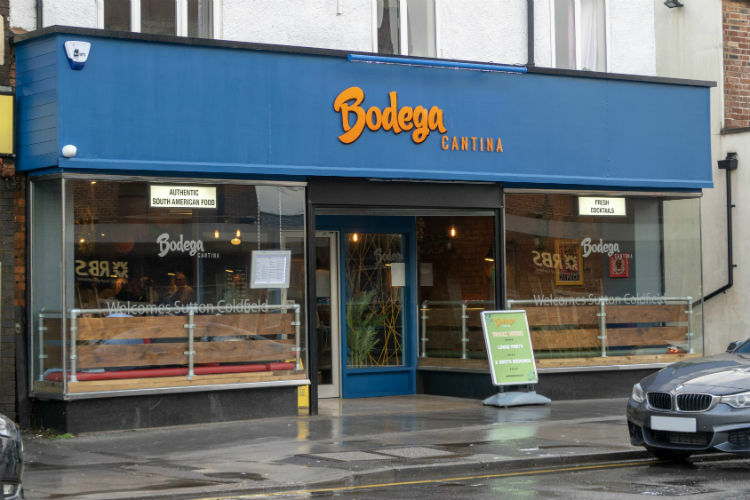 If you’re craving South American food but don’t want to travel into Birmingham city centre, a trip to Bodega Cantina in Sutton Coldfield is highly recommended! I’m a bit of a fan of Bodega Cantina, and I’ve reviewed their Birmingham city centre restaurant a few times here on the blog. So when they opened up a new restaurant in Sutton Coldfield in March 2018, I was very happy to accept their invitation to pay a visit to the new venue. This is the fifth Bodega Cantina, joining Birmingham, Worcester, Derby and Leicester. It’s about a 10 minute walk from Sutton Coldfield train station to Birmingham Road, and the rain was falling steadily as Mark and I walked through the town. But the cold, grey April weather was forgotten from the moment we entered the bright and colourful restaurant! The layout is a little different from the Bennett’s Hill restaurant. It’s more roomy, which makes in turn makes it feel more relaxed. I do love Bodega Birmingham but when I visit at busy times, I can sometimes feel a little bit crowded. The Sutton Coldfield restaurant has its own individual decor, but it’s along the same lines as the city centre Bodega. Think colourful artwork, fun decorations, and images of Mexican wrestlers! Like Bodega Birmingham, there’s a wall covered with South American inspired graffiti. And I love these longer bench tables, which are ideal for relaxed dining. We were shown to our table and looked through the menu. I’d already seen the new season’s menu when I visited Bodega Birmingham for a press night a few weeks ago, but it took us a while to decide what food to have. And that’s because you have to make a difficult decison. Do you go for the street food range of burritos, tacos and quesadillas? Or should you pick a range of small plates for sharing, tapas-style? But can you really ignore the selection of South American inspired larger plates? One thing is for sure, I have to have the tortilla chips when I go to Bodega! Last time Mark and I had dinner at Bodega, we had the nachos as our starter. And while they’re delicious, the pile of tortilla chips topped with cheese and three dips is just too filling for me even if I’m sharing a plate! Our second shared starter was a pair of tacos stuffed with sweet potato, chorizo, beans and spiced onions. I loved this combination of textures and flavours, and I think it might actually be my favourite of the four taco varieties on offer. Emma, our bubbly and helpful waitress, checked with the chef for us, who confirmed that you could omit the chorizo from this if you wanted to make it meat-free. These tacos are gluten-free thanks to the corn tortillas – all of the gluten free and vegetarian options are clearly marked on the menu. And if you’re looking for vegan options, there’s a whole menu for you to choose from. The Quinoa Chifa is a personal favourite! After much deliberation, we had opted to go for individual large plates, rather than sharing some tapas. I decided to try the Burger a la Parilla – Bodega’s twist on the classic burger. It’s a 6oz beef patty, smothered in cheese sauce, salsa fresca, and chimichurri dressing, topped with crisp iceberg lettuce and wrapped in a toasted tortilla. On the side, you get a portion of smokey coleslaw, and some of Bodega’s amazing sweet potato fries. The creamy sauce on my burger was delicious, and wrapping the burger in a tortilla made it a little easier to eat than if it had been in a bun. The patty was cooked well done, which is not my personal preference, but it was juicy and tender, and not dried out at all. I understand why restaurants prepare burgers this way, but it is still a little frustrating. If the patty had been cooked slightly less, it would have been a really good burger. The side order of coleslaw was fresh and crunchy with a hint of paprika in the dressing. But those sweet potato fries… They’re so good, they almost justify a visit on their own! Mark’s main course was the Lomo Saltado. This is a Peruvian dish of marinated beef steak, potatoes and vegetables which are flash fried in a teryaki sauce. He let me have a taste, and I really wished that I’d chosen that dish for myself. Big chunks of tender beef, cubes of crispy potato and vegetables, and a sweet, spicy sauce. I couldn’t resist digging back in for another forkful – it’s definitely something I’ll order for myself in the future. After our shared starters and these filling mains, we were yet again too full for a pudding. This seems to happen every time that I visit Bodega, and I would have loved to squeeze in a portion of their Churros with dulce de leche sauce, or a slice of Banana and Salted Caramel Cheesecake. Maybe next time we visit, I should just have starters and pudding? Of course, I can’t really review Bodega without talking about their bar. In the Sutton Coldfield venue, the bar runs along the length of the restaurant which gives you a great view of the drinks they offer. Whether you prefer your cocktail made with rum, tequila or mezcal, there’s a wide range of spirits to choose from. As well as a more familiar choice of gins, wines and beers. On this occasion I decided to drink wine with my meal, and had a lovely crisp Argentinian Pinot Grigio. Mark was going to be driving us back from the station so he stuck to Pepsi. But Bodega can also mix up some delicious mocktails, which I’ve tried on previous visits. For example, the Hummingbird is a mix of strawberries, lime, watermelon syrup and pomegranate, topped up with soda. And because all of the Bitters n Twisted venues have joined the campaign to ‘Ditch the Straw’, most drinks are served without a straw as standard. If you request a straw, or order an icefilled drink like a Caipirinha, the straw will be a biodegradable one. Big thumbs up to them for that! Our meal was complimentary, but the cost of our meal would have been £50.40. This included two glasses of white wine, two soft drinks and the food pictured above. We spent a relaxed evening enjoying some seriously delicious food. The Lomo Saltado in particular was a highlight, and Bodega staples like the tortilla chips with guacamole were high quality as expected. The layout and decor of the new restaurant is bright and cheery, but it doesn’t feel over-crowded. The staff at the Sutton Coldfield restaurant were very friendly, especially our waitress Emma, and the service was good. If you’re craving South American food but don’t want to travel into the city centre, then a trip to the Sutton Coldfield Bodega Cantina is highly recommended! Looks like a lovely evening out. They definitely had a lot of Mexican food as well as South American offer, which I like, as I’m more into Mexican food than South American…but great that they offer two continents worth of Latin American fare! Very good value as well. I’m in London so sadly can’t go there. It’s definitely one to bear in mind if you visit the Midlands! The restaurant looks lovely and bright and cheerful and the food looks delicious too. I really need to eat out!! Oh wow the food here really does look wonderful. The Churros with dulce de leche sauce sound amazing I’ve had it once before and it was really good. I love Churros, and the ones at Bodega are fab – I just wish I had been able to squeeze some in! I love cocktails, I bet the ones from here taste yummy! The food looks lovely too! This looks like such a quirky place to eat and the food looked delicious. Wow, I love the decor – the graffiti looks immense. Great that it’s roomy too. oh that looks amazing and im a huge fan of bright colours in restaurants it really draws me in! Churros are the best! The food looks wonderful and this would make for a nice evening out with friends. Dinner and some cocktails too.